There’s a party at DUO Gallery and you’re invited. 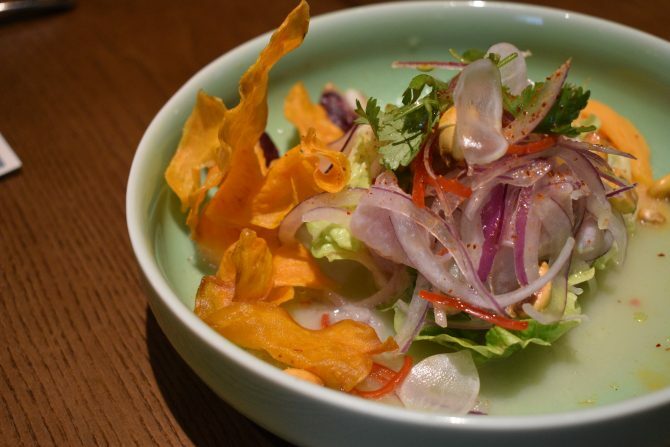 Possibly the first-ever Peruvian restaurant in Singapore, TONO Cevicheria is a refreshing addition to Singapore’s multi-faceted food scene with its offerings of authentic Peruvian cuisine. Not that we’ve been to Peru before, but one can definitely tell that the new restaurant truly embodies the tropical vibrancy of the South American country. From a dancing fish mascot to feel-good salsa music, dining at TONO Cevicheria is like jigging and jiving at a rambunctious festival. 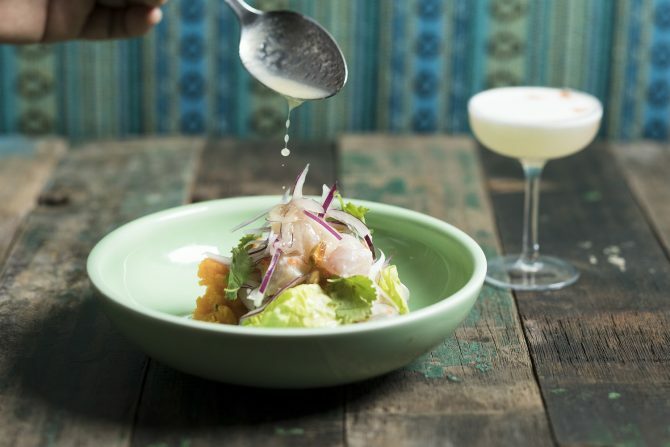 While our first taste of Peru was sipping on a Pisco Sour ($15) (a mixture Pisco and Angostura Bitters, topped with egg white foam), our culinary journey only began when we were presented with a Peruvian classic – ceviche. Like with most of the Peruvian dishes, ceviche reflects culinary influences from a range of countries such as Inca, Italy, Japan and China. But it is the Leche de Tigre or Tiger’s Milk that truly makes the ceviche uniquely Peruvian. We made acquaintance with this milky citrus-based seafood marinade after tucking into the Clasico Ceviche ($25). Made from the fish of the day, onions, sweet potato and lettuce, the classic eased us into the hospitality of the tangy Tiger’s Milk that we lapped up in glee. Alternatively, the Tono Ceviche ($28) is equally a yummy choice if you prefer crunchy baby calamari thrown in the mix. This time round, the Tono’s Tiger’s Milk is laced with the heat of smoked aji amarillo for that added spicy kick. In between nibbles of the addictive deep-fried plantain slices, Patacones ($6), we continued the seafood foray by digging into the Yellow Pituco ($24) of raw yellowfin tuna dressed with a chilli vinaigrette and Pulpo al Olivo ($28), that had slices of soft and bouncy sous-vide octopus drizzled with Greek olive mayonnaise and the herby chimichurri sauce, before proceeding to the meaty spoils of Escabeche ($22), featuring not only boiled chicken shreds seasoned to perfection, but also chunks of grilled chicken that were marinated in panca chillies, achiote oil and oregano. With a smidge of hesitation, we gingerly bit into the deep fried pork belly of Chicharron ($28), knowing all too well of its artery clogging repercussions. But alas, the flesh is weak and we inhaled the pork belly within seconds. Aside from its crispy exterior that conceals the melt-in-mouth flesh, the meat is doused with a smoky chilli and amarillo sauce before finally sprinkled with almond shavings for a welcomed crunchy and nutty finish. Likening to the Chinese Mui Fan, the rice-filled stew of Aguadito ($28) was promptly savoured in generous spoonfuls. We didn’t care much for the meaty inclusions of the fish and chicken as the piquant base of fish stock, white wine, lager and a whole array of spices and vegetables such as oregano and pumpkin was satisfying enough to have alone with rice. Ending our Peruvian adventure on a sweet note, we obliged to the sweet delights of Combinado ($12) and Tres Leches ($12). Served with grapes and apple cubes, the former is a vanilla rice pudding that boasts orange peel, coconut puree, and the exotic mazamorra that is created from purple corn boiled with pineapple skin and an array of spices. For something a little more conservative, the moist coconut cake of the Tres Leches, served with a tangy pineapple and passionfruit compote, makes for nice alternative without comprising on its Peruvian roots. Now, that’s some party you ought to be at. Operating hours: Monday -Friday: 12pm – 2.30pm, 6pm – 10pm, Saturday 6pm – 10pm. Closed Sunday.